HomeBeen blueberry picking this summer? Here are some great recipes for all those beautiful berries. Been blueberry picking this summer? Here are some great recipes for all those beautiful berries. Have you ever been blueberry picking? If not, it’s time to start a new family tradition. 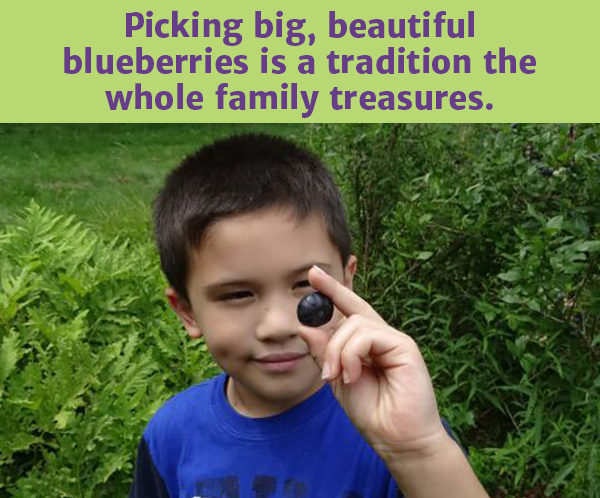 I remember having fun blueberry picking as a kid and it’s a tradition my children enjoy, as well. We plan in advance with my sisters and friends and make a big party out it. The past few years we’ve been going to Maple Lane Farms in Preston, CT, where the blueberries are big and sweet. We were a pack of twenty-one cousins, grandparents and friends last week when we descended on the blueberry farm. At Maple Lane Farms, there are two areas of blueberries across the street from each other. They have stopped caring for one of the blueberry fields and it is growing wild, but the berries over there are not sprayed at all, so that is where we pick. Most people don’t pick that side because it is overgrown with weeds, so it’s easy to find plenty of beautiful blueberries without looking very hard. In about an hour, my ten year old daughter, Jessie, and I picked over seven pounds of blueberries, and we aren’t fast pickers by any standard! After picking, we all had a little lunch under some trees where picnic tables are set up. A great time was had by all and the memories made are priceless. I then had seven pounds of blueberries to eat fresh, freeze, or cook with. I froze more than half the blueberries the day after we picked them. When freezing any fresh berries, I follow the same steps. First I wash and pick through them. Then I spread them in a single layer on cookie sheets and put them in the freezer. Once frozen, I move the berries to freezer-safe containers and put those back in the freezer to use at a later time. This method makes it easy to use in the future because they are not in big frozen clumps, but individual frozen berries. I can pour out exactly four cups for blueberry crisp or a handful for blueberry popsicles. Below are a couple of the blueberry recipes I’ve made this year that my family loves. Preheat oven to 350°F and grease a 9 x 9 pan (I apply coconut oil with a pastry brush). Place the blueberries in the bottom of the baking dish. Combine the tapioca starch, lemon juice, cold water and natural sweetener. Mix well, then pour over the fruit, stirring to coat the blueberries. Then spread the blueberries along the bottom in an even layer. Combine the topping ingredients, mixing well. Drizzle the topping over the fruit mixture. Bake in preheated oven for approximately 35 minutes, until the fruit is soft and the fruit mixture is bubbling. 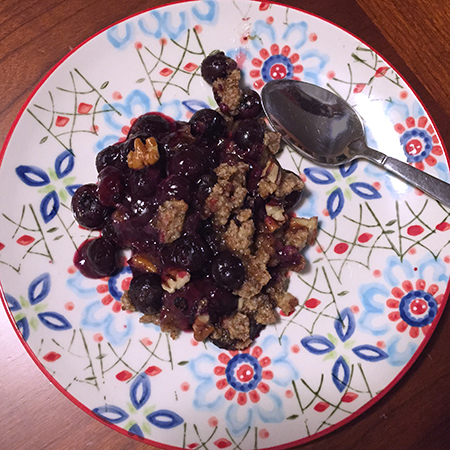 This Paleo Blueberry Crisp recipe was adapted from www.Perfect-Supplements.com. I love the benefits of erythritol, but it is very expensive and, to me, has an after taste similar to other sugar substitutes. I cut it with coconut sugar, which is not calorie free, but has a low glycemic index and is Paleo-friendly. *I had never made homemade lemonade without sugar, so I separated unsweetened lemonade into 3 parts and tried each of the sweeteners. I love coconut sugar for baking, so I tried that first. I found it added a flavor that didn’t really belong in lemonade and it turned the lemonade brown – not very appetizing. I love the benefits of erythritol (almost 0 calories) but find it has an aftertaste in baked goods. I usually use 1/2 coconut sugar and 1/2 erythritol when baking. I was pleasantly surprised to find the erythritol to be excellent in the lemonade. The honey was also very good in the lemonade. Liquefy sweetener in 1 cup water. Honey & erythritol will melt in hot tap water, but the coconut sugar needs very hot to boiling water. Pour lemon juice and 4 cups cold water into a glass pitcher. Add sweetened water and stir well. Serve with ice cubes, or make into Blueberry Lemonade Popsicles (below). Tip: To make squeezing the lemons easier, cut in half and freeze them ahead of time. They are much softer once thawed. 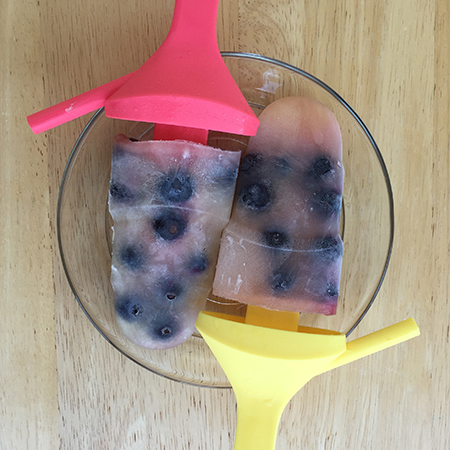 Fill pop molds 1/4 to 1/2 full with blueberries. Fill the remainder of the way with lemonade (recipe above). Freeze several hours or overnight. Enjoy! In a separate bowl, whisk the coconut oil, honey, vanilla, and lemon juice well. Mix the dry ingredients with the wet ingredients on low-medium speed until any lumps are gone and the batter is smooth. Place 3 whole eggs plus 2 yolks (save the 2 whites for later) in a medium sized bowl. Slowly add the eggs to the batter, 1/3 at a time, mixing well to fully incorporate each addition. Beat the 2 egg whites in a small bowl to create soft peaks, then fold into batter. Add chocolate chips last. Grease and line an 8″ square pan with parchment paper so that two ends of paper fall over the pan edges for easy cake removal once baked. Bake for 30-45 minutes, until a toothpick inserted in the middle comes out clean and cake is a golden brown. Since baking time may vary, watch closely for the last 15 minutes. After the cake has cooled for 10 minutes, run a knife around the edge and remove cake from pan. Allow to cool completely to avoid an eggy taste. 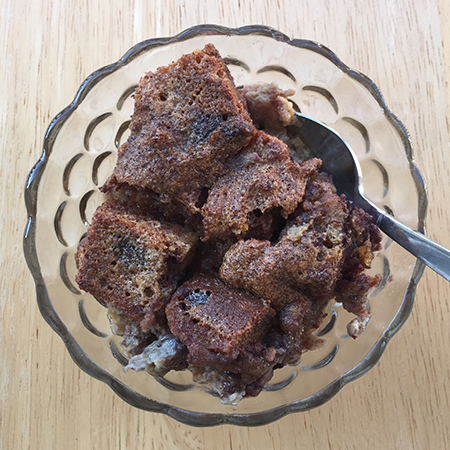 Enjoy cake as is, or proceed to the next steps below to make a Paleo bread pudding. Spread the cubes of bread in a small (7×10) casserole dish. Mix remaining ingredients well, folding in blueberries at the end. Bake for 40-45 minutes. It will be ready when the center has set. Allow to cool long enough so you can eat it. YUM!!!! Paleo Pound Cake recipe adapted from urbanposer.blogspot.com and Paleo Blueberry Bread Pudding recipe from paleOMG.com. Set aside 2 tablespoons of almond flour for later. Combine remaining almond flour, coconut flour, and salt in a large bowl and mix well. Whisk together egg yolks with honey and vanilla in a separate bowl. Whip egg whites to stiff peaks. Then combine with the rest of the wet ingredients. Whipping the egg whites helps the muffins expand when cooking, so they are not so dense and end up with nice muffin tops. Add wet ingredients to dry ingredients and blend thoroughly. Gently fold in blueberries. Grease a large-cup muffin tin with butter or Perfect Coconut Oil. Fill each cup 3/4 full, then pat tops down into rounded heaps and brush with melted butter or coconut oil. Dust tops with remaining almond flour. Bake for 30-40 minutes, until muffins are firm but spring back when pressed. Paleo Blueberry Almond Crumb Muffins adapted from NourishedKitchen.com. 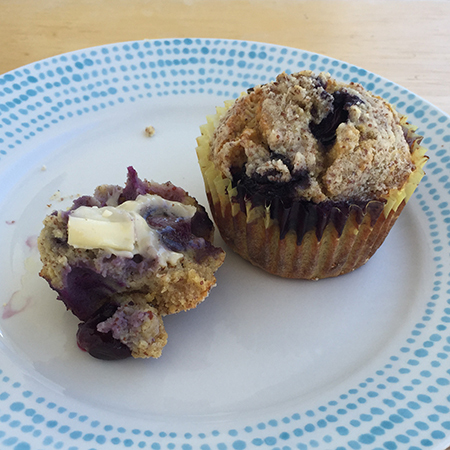 These grain-free blueberry muffins freeze well for a quick Paleo-friendly breakfast on the go! Nice article, Thank a lot.